Five weeks travelling in Bhutan and Nepal in October-November 2015 needed careful packing. In Bhutan temperatures were similar to a pleasant summer's day in the UK, but our Nepal destination of Annapurna Base Camp suggested temperatures well below freezing and all points between the two. My trusty Pinnacle Jacket, merino zip top and leggings and three pairs of "investment knickers" were the starting point, followed by a motley range of clothing, from shorts to the fleeciest, oldest hat (deeply unflattering, but this is the Himalaya we are talking about). The intention was to gift much of my gear once the trek was complete, our adventure coming only six months after the devastating earthquakes in Nepal and all contributions being desperately needed. Two weeks in the Kingdom of Bhutan was magical. The wooded hills and valleys, almost-Alpine scenery, remote villages and smiling people gave us a unique and privileged insight into a country which restricts visitors and works hard to preserve both environment and tradition. Half of our party then returned home whilst six of us, average age 66 years, embarked on The Trek. Our trek team of two guides and three porters were wonderful. Maybe they saw us as a challenge, but our fortnight together was challenging, great fun and fascinating as they introduced us to a culture and people of great generosity, resilience and charm. 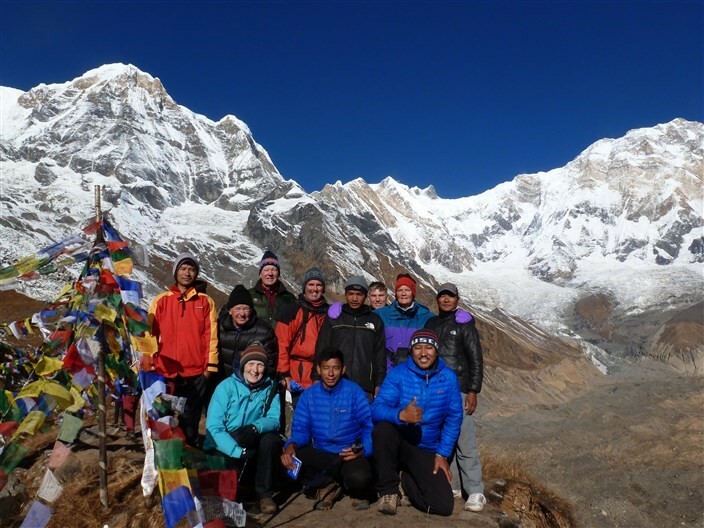 Yes, it was a Big Climb, but we did it, arriving at Annapurna Base Camp, 4130 metres and also called Annapurna Sanctuary, in cloud and snow, but being rewarded the following morning by the clearest dawn, sparkling sunshine on the summits of the mountains, majestic and timeless. Never to be forgotten, it was the most stunning and humbling experience. Luxuries were the basics: electricity, water, a reasonably fragrant loo, and a towel. These were by no means standard and a large plastic sheet was very useful beneath my sleeping bag in case of damp or grubbiness. I usually slept in my merino base layers which were invaluable, warm and retaining their freshness, unbelievably, as I never washed them and even wore the zip top on our final celebratory dinner in Kathmandu - but I did put on fresh earrings! Returning home, my granddaughter looked at the photos and asked why I had not taken more luggage. Telling her my three tee shirts and three pairs of pants were plenty, as they were washed and soon dried on our rucksacks, she was horrified, but accepted that the porters had enough to carry. "No, granny, I won't be doing that, because I would need thirty five pairs of knickers and a guarantee of broadband". Leaving a pile of my gear in Nepal, the Pinnacle jacket, merino and "investment" underpinnings came home with me. They have many more adventures to complete before they will be passed on.